A drunk who spat blood at a member of an ambulance crew trying to help him has narrowly avoided jail. William Turner had his jaw broken in an assault and was being rushed to hospital for treatment. 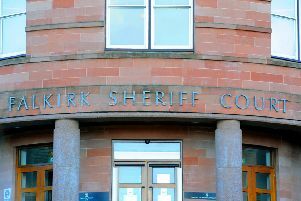 At Falkirk Sheriff Court last Thursday his behaviour was described as “appalling”. Turner (25), 7 Ettrick Court, Grangemouth, was in court to be sentenced for his actions towards emergency service personnel on March 18, behaving in a threatening manner at his ex-girlfriend’s house in Culvain Place, Falkirk, on March 7 and breaching bail on March 9 by sending her text messages. Police who responded to the incident in the early hours of March 18 in Poplar Street, Grangemouth, had found Turner “unable to stand” and called an ambulance. While it was taking him to hospital he repeatedly spat blood towards a member of the crew. Turner was also drunk when he started shouting and swearing in the woman’s home on March 7, smashing a vase, kicking doors and refusing to leave. Police were called and he was arrested. When he appeared in court from custody the next day he had sentence deferred for background reports and bailed on the condition he have no contact with her. But he ignored that order on March 9 by sending her text messages claiming he was “sorry” and “I still love you”. Mr Bryson said: “He was trying to show contrition for the earlier incident and losing someone very important in his life. Sheriff Derek Livingston accepted the texts were an attempt by Turner to effect a reconciliation, but said his behaviour in the ambulance was “appalling”. As a direct alternative to jail, he placed him on a two-year supervised community payback order with the added condition he complete 240 hours unpaid work in nine months and attend alcohol counselling and treatment if ordered to do so by social workers.